The Pacific Collection Access Project had the privilege of working closely with Kumu Auli'i Mitchell and Kumu Keonilei Leali'ifano. Knowledge holders of Hula and Hawaiian 'ōlelo (language), their extensive mana'o (thoughts and meaning) surrounding the history and material culture of Hawai'i activated and enriched the cultural context surrounding the Hawaiian collection. 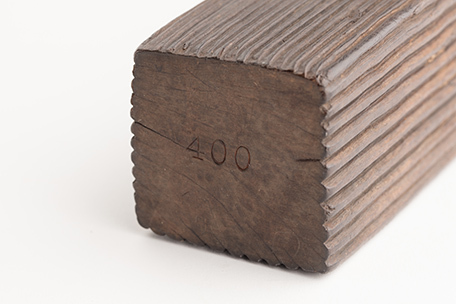 The Pacific Collection currently holds over 33 Hawaiian objects attributed to kapa. Kapa is a significant textile to Hawai'i. However, the origins of its process reflect the rich culture and history that uniquely defines Hawaiian kapa across the Pacific. 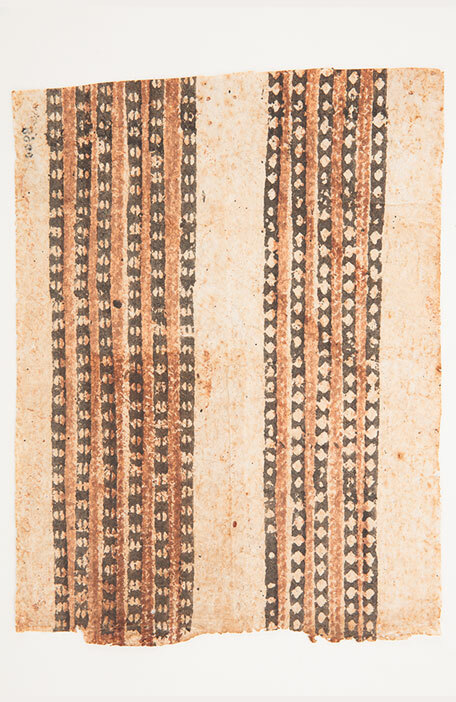 Header: Kapa (Barkcloth sample), 51991, 1986.217, Auckland Museum Tāmaki Paenga Hira. Cultural permissions apply. Kapa is primarily made from wauke, and requires a number of tools and natural dyes to create it. Background: Kapa (Barkcloth), 11393, Auckland Museum Tāmaki Paenga Hira. Cultural permissions apply. According to Kumu Keonilei the context of a mala wauke is a garden that contains one's needs to fulfil the purpose of making kapa. A mala wauke grows wauke as well as the dye plants necessary for decorating kapa. Cultivating the wauke for kapa can take up to two years or less. Small branches along the stem are carefully tended to prevent holes on the kapa. Once the stem has reached its desired diameter and length, a pahi (knife) can be used to cut the stem and pull away the outer bark. 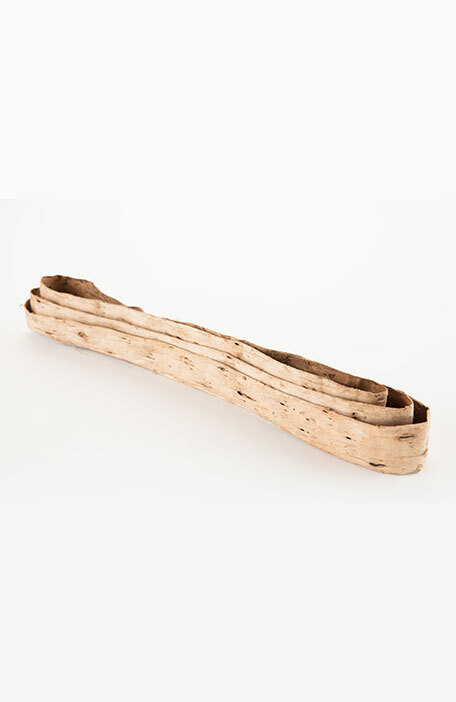 A wa‘u (scraper) can be used to separate and clean the outer bark revealing ‘ili wauke (raw baste). 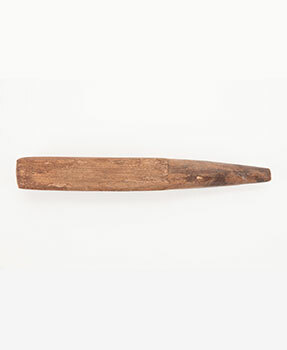 Right: Wa'u (Whale bone scraper), 11393, 4511, Auckland Museum Tāmaki Paenga Hira. Cultural permissions apply. The wa’u can be made from either a serated sea shell such as ‘opihi (limpet) or bone. 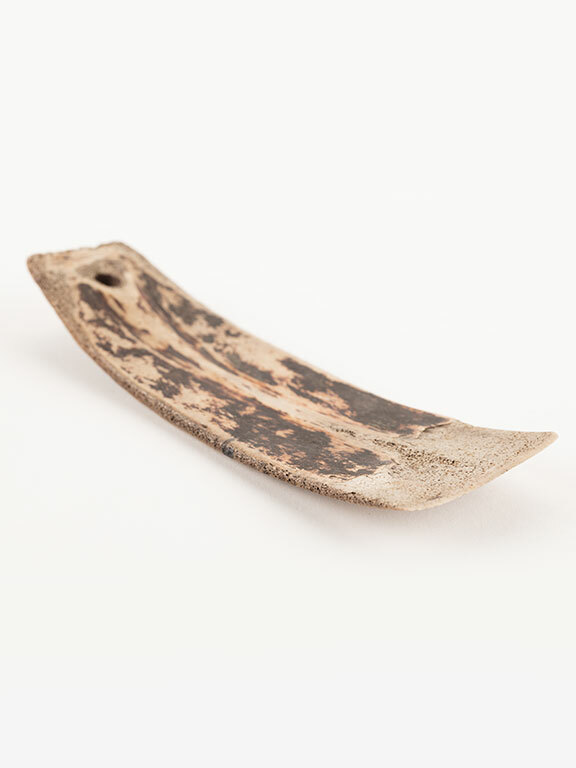 Auckland Museum’s Pacific Collection displays one made of bone in the shape of an inward curved trapezoid. A perforation features at the tapered end. 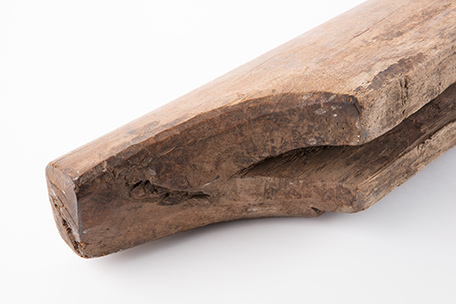 Opposite, the wider end is worn from its use in scraping and working the bark to reveal ‘ili wauke (below). Above: 'Ili wauke (Raw baste from tree bark), 11353, Auckland Museum Tāmaki Paenga Hira. Cultural permissions apply. ‘Ili wauke can appear very small in width, thick in depth and long in length. Small holes sometimes remain from the presence of shoots. 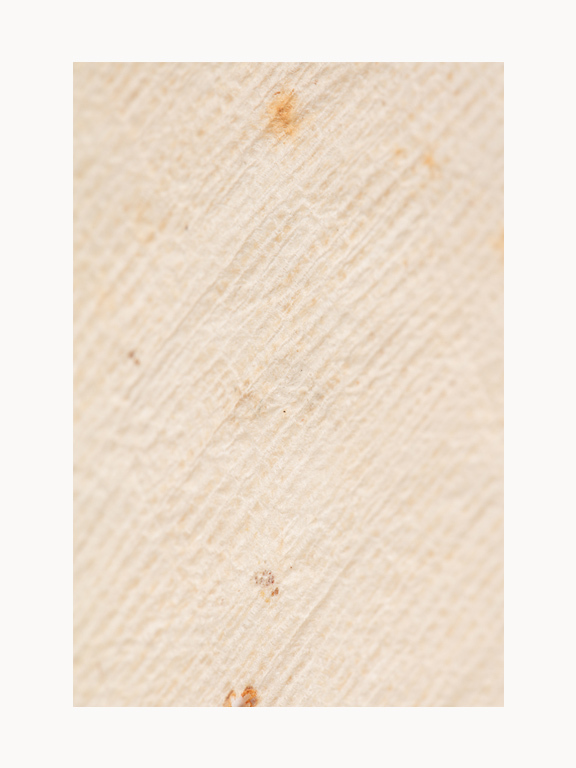 In its raw form, it can feel fibrous and starch-like. It can be bundled and dried for storing until further use. 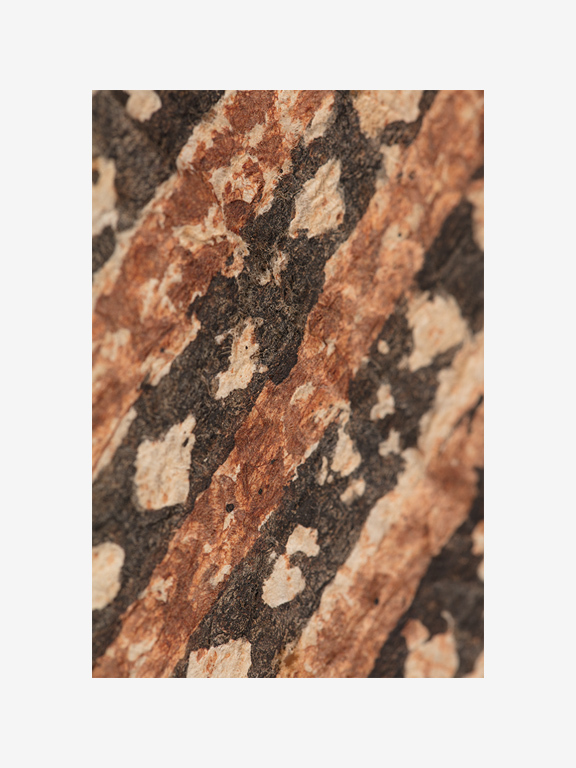 Compared to other island nations who produce bark cloth, Hawaiian kapa is uniquely defined by the various stages of beating, fermenting and watermarking. The daughters of Maikōha have a historic influence on how the wauke was processed to become kapa. Lauhuki taught the art of beating the ‘ili wauke and her sister La‘ahana taught the process of watermarking, and use of ‘ohe kāpala (bamboo dye stamp) to decorate the kapa. Through their teachings they became ‘aumakua (ancestral craft gods). Producing kapa can differ depending on the makers intentions. This can influence which tools to use as well as fermentation, watermarking or dye plants used in the lead up to the final kapa. When it comes to beating the ‘ili wauke, the hohoa (beater) is the first to make contact with the ‘ili wauke. 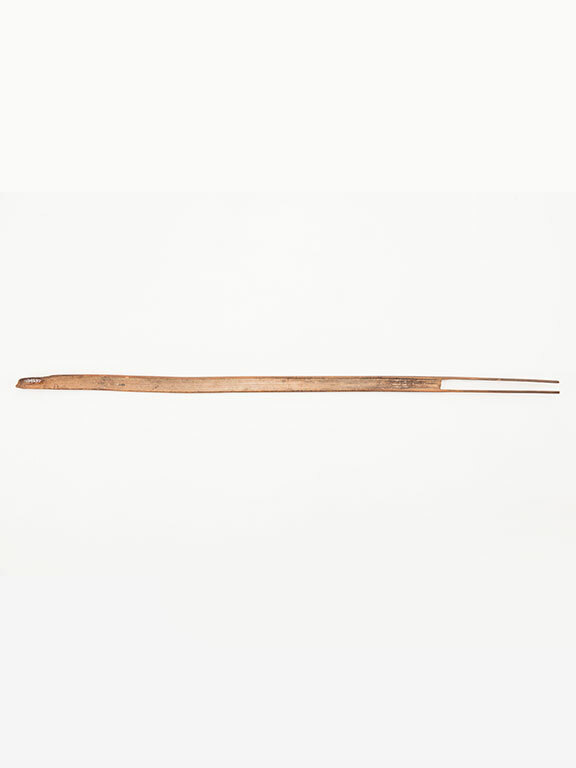 This is made of lā‘au (hard wood) and features a handle with a club-like end. Its entirety is smooth in surface. After soaking the ‘ili wauke it would be laid upon a large smooth pōhaku (stone), maybe scraped with ‘iwi (shell scraper) or a ‘wa’u and then beaten with a hohoa until dry. This is called the mo‘o mo‘o (plain, untreated bark cloth) stage, when the fiber becomes cloth-like, plain and untreated. The continuous beating stresses the ‘ili wauke by spreading and flexing the fibres to become mo‘o mo‘o. Right: Hohoa (Barkcloth beater), 11365, Auckland Museum Tāmaki Paenga Hira. Cultural permissions apply. Following the fermentation process, the i‘e kuku (a finer beater) is the next to make contact after fermentation. This style of beater features a handle with a long four sided mallet that forms a square at the cross section. Each side shows carved linear grooves that vary in width. These sides would be rotated upon beating the mo‘o mo‘o and continues the spreading of fibres. This stage of beating can define how thick or lace-like the maker or makers wish to work it. 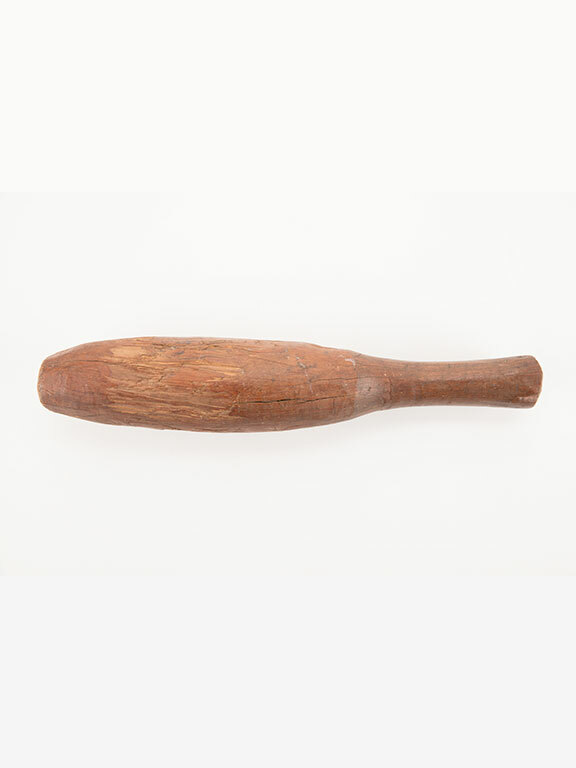 I'e kuku (Barkcloth beater), 400, 11364, Auckland Museum Tāmaki Paenga Hira. Cultural permissions apply. This second stage of beating takes place on a carved kua kuku (wooden anvil), which is also made of lā‘au. Its form has been likened to a kua (spine) where the surface extends further than the base. Internally it is hollowed and the extended ends would sit, raising it off the ground upon two pōhaku. The mo‘o mo‘o is laid over the kua kuku and the second stage of beating with an i‘e kuku begins. 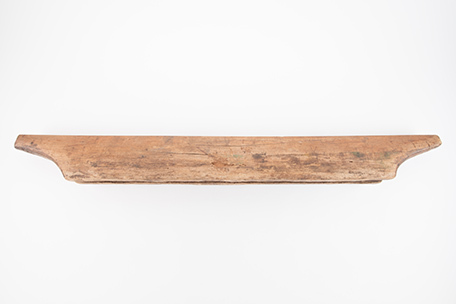 Kua lā'au / Kua kuku (wooden anvil), 24248, 1938.210, Auckland Museum Tāmaki Paenga Hira. Cultural permissions apply. After the beating stages some dampness is left in the beaten wauke for the watermarking stage. This is made by another form of i‘e that will feature different kinds of patterned motifs on each side. In some cases, a combination of linear grooved sides and patterned motif sides on one i‘e. Right: I'e kuku (Barkcloth beater), 400, 11364, Auckland Museum Tāmaki Paenga Hira. Cultural permissions apply. It is said that the watermarked designs imprinted onto kapa can reflect the lineage or area of the maker. For example, a maka ūpena (below) - a carved design featured on the i‘e kuku below, features a diamond style grid with circular impressions inside each diamond. This is a common watermark found on Hawaiian kapa, ‘maka’ meaning ‘eye’ and ‘ūpena’ meaning fishnet. However, like the maker, these designs can differ depending on their intentions. I'e kuku (Barkcloth beater), E23, 14525, Auckland Museum Tāmaki Paenga Hira. Cultural permissions apply. Above: I'e kuku (Barkcloth beater), E23, 14525, Auckland Museum Tāmaki Paenga Hira. Cultural permissions apply. Once dry, surface decoration can commence. 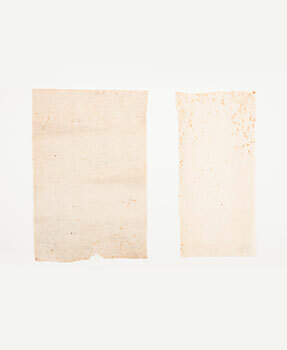 This can be done through the use of dye plants, ‘ohe kāpala (right) - bamboo dye stamp, and lapa (below) - bamboo guide. Ideally the dye plants would be gathered from the mala wauke and prepared accordingly. 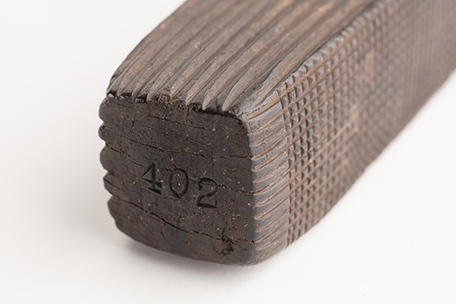 Right: 'Ohe kāpala (Bamboo stamp), 11358, Auckland Museum Tāmaki Paenga Hira. Cultural permissions apply. 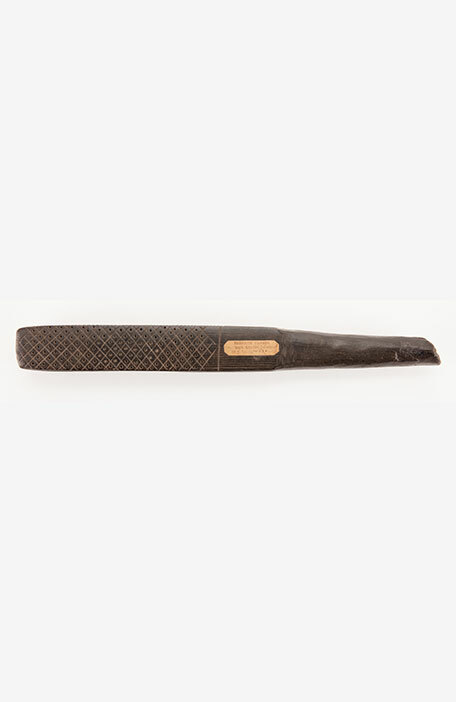 ‘Ohe kāpala are cut sections of ‘ohe (bamboo) stems that feature geometric designs carved into one end to form a stamp. 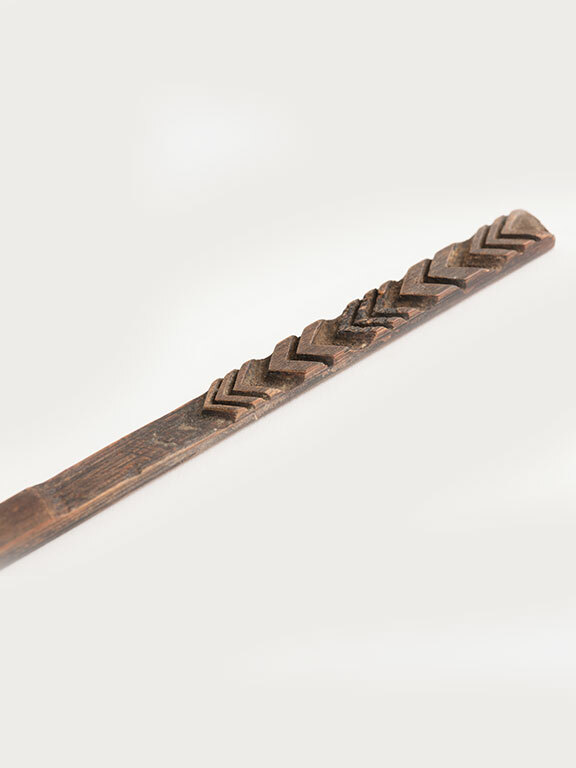 A lapa, also carved from cut sections of ‘ohe stem features prongs on one end. The lapa is used as a guide to create linear designs upon kapa. However, it is important to note that these designs were not made to look decorative but for a certain degree of intention. Like the variety of i‘e used for watermarking, a surface design could portray the makers lineage, environment or even a reflection or response to whom the piece would be made for. Above: Lapa (Marker), 14530, Auckland Museum Tāmaki Paenga Hira. Cultural permissions apply. Auckland Museum’s collection of kapa samples and pieces give light to the original qualities that attribute them to Hawai’i. 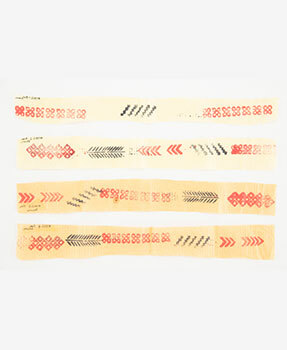 Their aspects visually and physically demonstrate the use of the lapa, the ‘ohe kāpala, natural dye use and unique watermarking techniques. Some are thick and some are as delicate as fine lace. Right: Kapa (Barkcloth sample), 51991, 1986.217, Auckland Museum Tāmaki Paenga Hira. Cultural permissions apply. Above: Kapa (Barkcloth sample), 49087.1, 49087.2, 49087, 1981.51, Auckland Museum Tāmaki Paenga Hira. Cultural permissions apply. 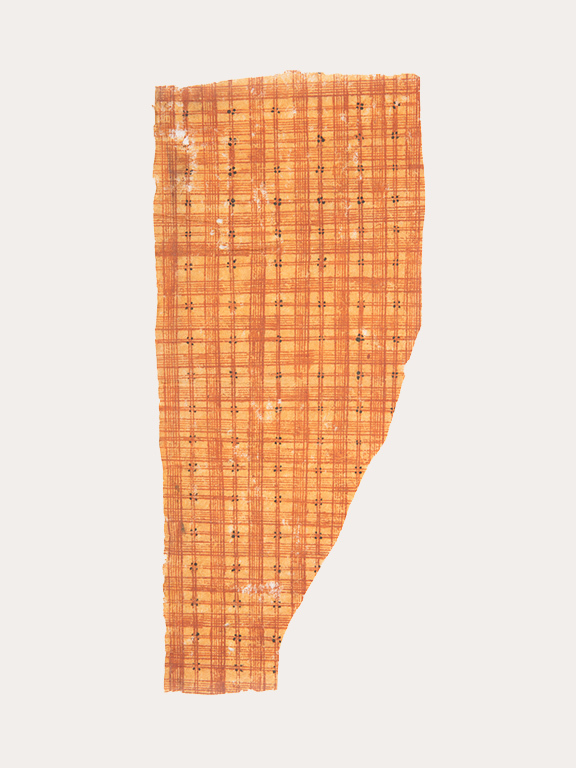 Kapa (Barkcloth sample), 49087.1, 49087.2, 49087, 1981.51, Auckland Museum Tāmaki Paenga Hira. Cultural permissions apply. 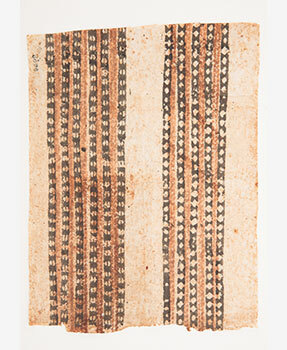 Above: Kapa (Barkcloth sample), 8908, 1922.11, Auckland Museum Tāmaki Paenga Hira. Cultural permissions apply. We would like to give thanks to the Hawaiian knowledge-holders who generously shared their mana'o (thought; meaning) and sources surrounding the significance of kapa. Additionally, we would like to honour the ‘aumākua, who gifted kapa to Hawai‘i nei. Cultural Permissions Apply - please contact images@aucklandmuseum.com to seek permission to use any of these images. [ii] Personal communication by Kumu Auli’I Mitchell and Kumu Keonilei Leali’ifano to the Pacific Collection Access Project Staff as part of the Pacific Collection Access Project at Auckland Museum on 7 March 2018. [iv] Personal communication by Kumu Auli’I Mitchell and Kumu Keonilei Leali’ifano to the Pacific Collection Access Project Staff as part of the Pacific Collection Access Project at Auckland Museum on 7 March 2018. Many of the titles listed below are available in the museum's research library. M. Beckwith, Hawaiian Mythology. U H Press. 1970. T. R. Hiroa, Arts and Crafts of Hawaii. Bishop Museum Press. 1957. S. M. Kamakau, Nā Mo‘olelo a ka Po‘e Kahiko: Tales and Traditions of the People of Old. Bishop Museum Press. 1991. S. Kooijman, Tapa in Polynesia. Bishop Museum Press. 1972. M. K. Pukui, Ōlelo no‘eau: Hawaiian Proverbs and Poetical sayings. Bishop Museum Press, 1983. 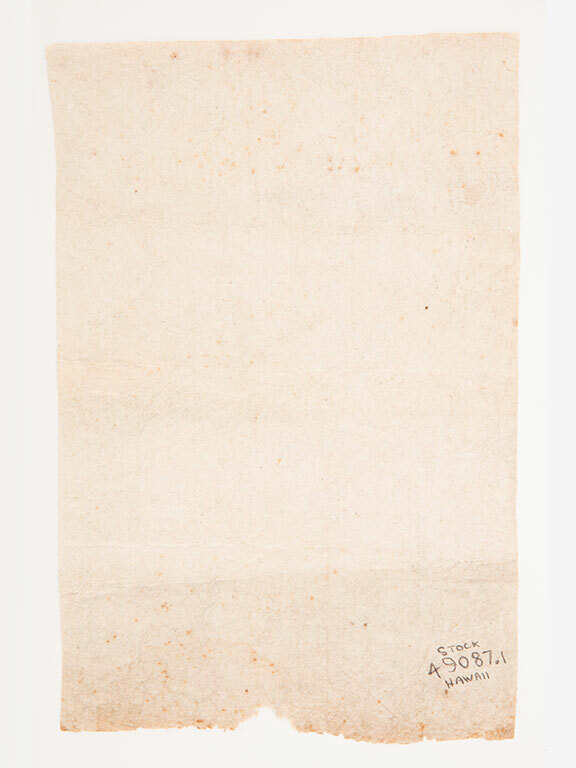 This was written by Sonya Withers as an extension of the mana‘o shared from Kumu Auli‘i and Kumu Keonilei Leali’ifano as part of The Pacific Collection Access Project, Auckland Museum. Sonya is of Samoan descent and has been working as a collection technician through PCAP.